But hey, its cool and I am NOT sorry and this is why! Now you cant tell me thats doesnt get your blood pumping with excitement, can you? anyway lets just do this thing shall we? 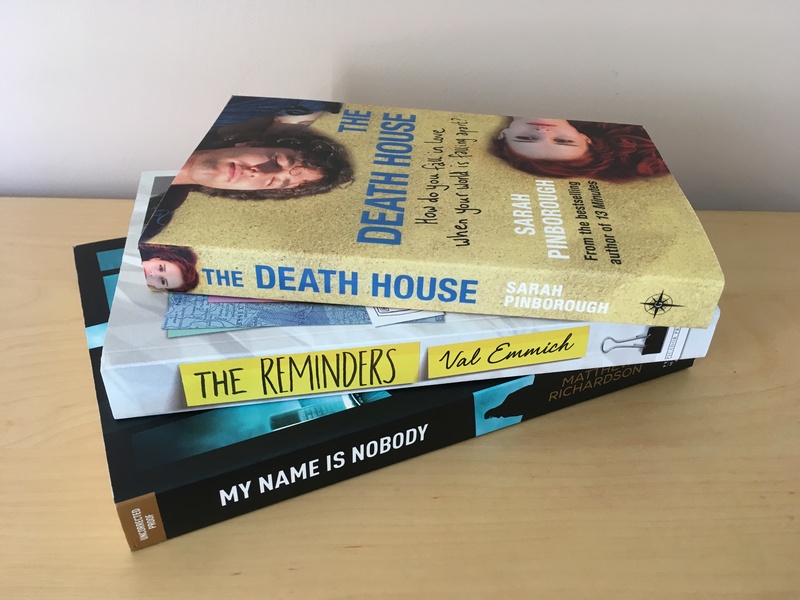 Stevie over at Gollancz kindly contacted me to see if I wanted a copy of Sarah Pinboroughs The Death House and of course I said YES! Toby is a boy who has forgotten how to live. Clara is a girl who was born to die. Toby’s life was perfectly normal . . . Taken from his family, Toby now lives in the Death House. Isolated from the outside world the inhabitants of are watched for any signs of a mysterious illness . . . Clara was a girl who had everything. Adored by her friends and her family, her life was destined for greatness. Now, Clara is the newest resident of the Death House and she’s determined not to allow her life to end there. This is Toby and Clara’s story. Next Lucie at Picador sent me The Reminders by Val Emmich! I requested it afer having seen pictures of it on Twitter. Overcome with the loss of his boyfriend Sydney, Gavin Winters has set fire to every reminder in their home. A neighbour has captured the blaze on video, turning this little-known TV actor into a household name. Gavin flees LA for New Jersey, where he hopes that ten-year-old Joan, the daughter of a close friend, can reconnect him with the memories of Sydney he is now in danger of losing for ever. Joan was born with a rare ability to recall every single day of her life in perfect detail, and in return for sharing her memories of Sydney, Gavin will help her write a song for a local competition. For Joan has had enough of being the girl who can’t forget – she wants to be the girl who will never be forgotten . . . Charming, beautifully observed, poignant and funny, The Reminders by actor and musician Val Emmich is an irresistible story of the unlikely friendship between a grief-stricken man who can’t remember and a ten-year-old girl who can’t forget. and last but not least in any way Michael Joseph Books sent me My Name is Nobody by Matthew Richardson. Solomon Vine was the best of his generation, a spy on a fast track to the top. But when a prisoner is shot in unexplained circumstances, and on his watch, only suspension and exile beckon. Three months later, in Istanbul, MI6’s Head of Station is violently abducted from his home. With the Service in lockdown, uncertain of who can be trusted, thoughts turn to the missing man’s oldest friend: Solomon Vine. Officially suspended, Vine can operate outside the chain of command to uncover the truth. But his investigation soon reveals that the disappearance heralds something much darker. And that there’s much more at stake than the life of a single spy . . .
Now to show you all the books i naughtily bought myself! 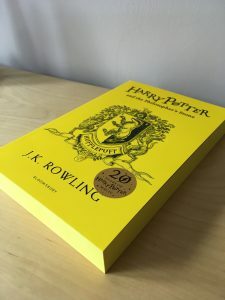 I adored the Harry Potter series like so many millions of readers but i’ve not bought them in any other form since they came out the first time round but once i saw the new ‘House editions’ I knew i had to have one and being a Hufflepuff it was the yellow one for me, and how gorgeous it is too with the sprayed edges for goodness sake! 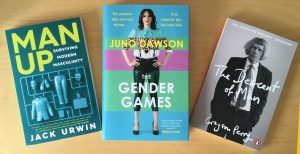 The Descent of Man by Grayson Perry, Man Up by Jack Urwin and The Gender Games by Juno Dawson are all on the theme of men and gender which is something i’m fascinated by and have to admit I hadnt thought much about before so I am gonna love reading these. I couldnt resist the next two mainly due to their gorgeous new matching covers. Lorali and Aurabel by Laura Dockrill sound so good and I’ve not heard a bad thing about Lorali so it was a no brainer! And The Serpent King & Goodbye Days by Jeff Zentner both looked and sounded so good and they have been so highly recommended on You Tube that I had to see for myself. Dont they make a great package? 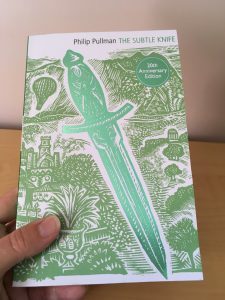 I am so, so, so, so late to the party when it comes to Philip Pullmans His Dark Materials. I did read Book 1 a good many years back but never got around to the rest but since reading a sneaky first chapter of his new upcoming Prequel, The Book of Dust coming out in October I knew i had to read me the others first. I loved the chapter so much I have pre-ordered me a copy. I just adore these new covers too with the shiny parts and the oh so subtle design, so much better than the previous garish ones, IMHO. And finally, I really fancied some poetry and it has to be modern poetry nowadays. I just cant read the old classics right now, dont ask me why! 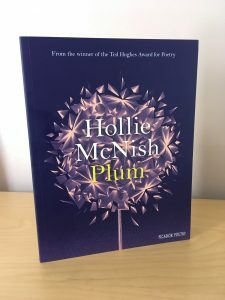 ( I said, dont) Having heard good things about Plum by Holly McNish I had to get me a copy. Well there you have it. A very tasty selection I think you’ll agree. 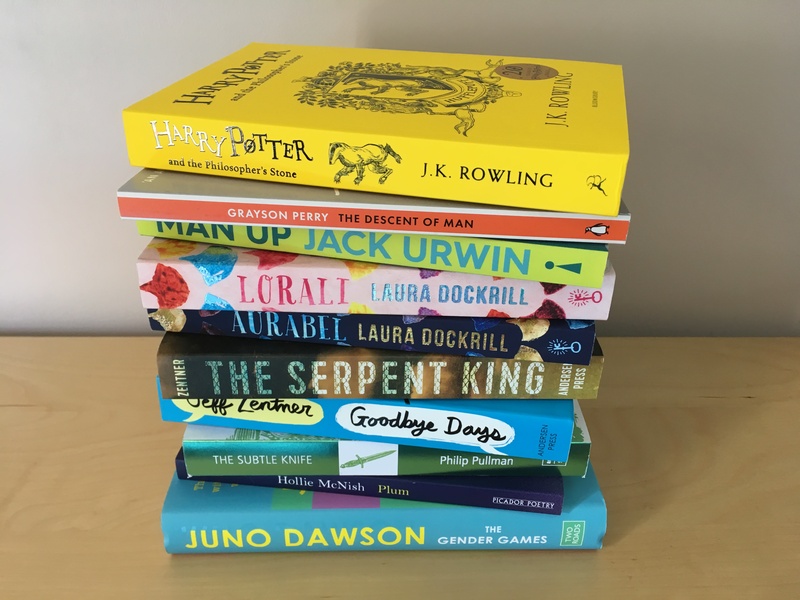 What do you think of my choices, and what books would you recommend based on these? Thank you Mareli, thats a lovely thing to say. Yes, The Serpent King certainly is a popular choice right now. I really appreciate you visiting me. Love your list and your post is presented so beautifully. There are a few of these I would love to see on my own shelf. The Serpent King for one. Hope you enjoy all your new reads. Hi Alyssa, Thanks so much for visiting my blog, and your kind words. Your book photos are so pretty. 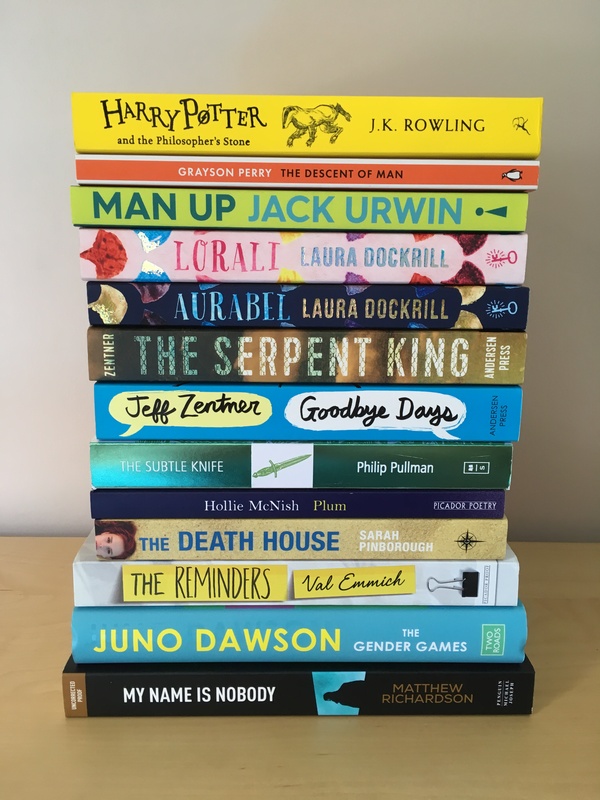 😀 That is a great stack of books! The only one I recognize is The Serpent King. I had a hardcover of that one but gave it to a fan who really wanted a copy. 😀 I hope you enjoy all of your new books! Hi Eve, Those new editions are fab arent they? If they made them for each book i’d be broke. Thanks so much for stopping by. I have been wanting the Ravenclaw edition so badly! 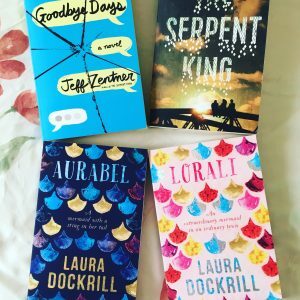 Congrats on the new books!